I think about comic books all the time. (Don't you?!) The slightest visual provocation can trigger a recollection of a memorable comic book that I may not have even viewed for decades. I have an example. I was in the grocery store, in the fruit aisle. I saw the pineapples next to the cantaloupe melons and their juxtaposition made me think of a famous pair of comic book covers. 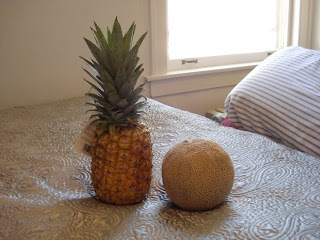 Here, I bought those fruits and took a picture so I could show you. There used to be huge World's Fairs/Expositions held in large cities on an almost-annual basis, starting way back in 1851. The 1893 World's Fair in Chicago is renowned for its introduction of the Ferris Wheel; the 1933 Fair was also held in Chicago; and I remember hearing a great deal back in my youth about Expo '67 which was held in Montreal. But wait, I skipped an important one! The New York World's Fair was held in New York City in 1939 and 1940, and the visual trademark of this Fair was a side-by-side pairing of a triangular obelisk they called a "trylon" and a large ball-shaped building they called a "perisphere." The trylon was 700 feet tall and the perisphere was 180 feet in diameter, and fair-goers entered and exited these structures. There was even a U.S. postage stamp depicting the trylon and perisphere, and here is an actual photo of them. What's the comic book connection? For one thing, July 4 1940 was designated as Superman Day at the Fair; a superboy and a supergirl of the day were crowned and the first actor ever to portray Superman appeared in costume (keep in mind that Superman was a new quantity at this time, having first appeared just two years prior in 1938's Action Comics #1). Thanks to Wikipedia for telling me about Superman Day!